Chocolate Roses Blog Tour with Prizes! Other days I feel like the goat and know I can make it! Annette Lyons has been running her blog for four years now and is giving away TONS of prizes! Check her and her blog out here. Let the Words Flow is giving away an ARC of PARANORMALCY. Also, Let the Words Flow is giving away THE FORETELLING by Alice Hoffman here. Anne Bradshaw is giving away HOMETOWN GIRL by Michelle Ashman Bell. Read her interview and enter to win here. Honestly, people! I'm getting tired of trilogies! I just want to read a good book, set it down and not have to wait for the next book! Win a signed copy of TELL ME A SECRET on Searching For A Good Read, and on Christine Fonseca's site. Win a copy of THE ETERNAL ONES here. Here is a contest to win COMPROMISED or FREEZE FRAME. Fire And Ice is having a few contests: City of Angels signed book, flower child necklace, cute doll, photo print, Pietersite ring, yummy Sandalwood cleansing grains, bookmarks, and a wolf pendant. PHEW! Over on Babbling Flow is a contest for 7 ARCs! runs from July 20-Aug 6. Check it here. And then mouse on over here where you can win 7 more ARCs! Constant Revision is giving away awesome books like the 2010 WRITER'S MARKET book. Even though I don't normally like editing (who does? ), I've been enjoying myself. I've been taking my WIP and line by line working on taking my characters from 2-D to 3-D.
My critique group finds my grammar errors and straightens me out, which I am truly grateful. While editing, I decided I'd better give my MC a convenient weakness. She has to go inside underground tunnels to rescue her boyfriend so I think she gets to be claustrophobic. Now I have to go back and put in a few lines here and there with her phobia popping up. Which makes me go back to editing! Just when I thought I could see the light at the end of the tunnel! I keep reminding myself that I'm learning. Does this picture entice you to write a short story or poem? I feel like summer is finally here! My family is all home for at least two weeks and we can have some sort of informal schedule. June was spent in three scout camps, getting ready for said scout camps, youth conference, getting ready for girls camp, girls camp, hubby traveling, Drama Teen getting a job, and washing all the clothes to be repacked again. Today I was in a routine again. I haven't really been writing this summer because, I guess you could say, I've been busy. I've made sure I had my chapters ready for critique and I scheduled blog posts. But I haven't felt like I could take the time to sit and write. I like to have more than 30 minutes to be creative. But the last two or three days I've had two whole, uninterrupted hours together and I found myself grinning and centering and relaxing and enjoying my writing (even if it was just editing). Failure is not negative. It is a teacher. It molds, refines, and polishes you so that one day your light will shine for all to see. It isn't the failure you experience that will determine your destiny, but your next step and then your next, that will tell the story of your life. I've won a couple of contests recently. I don't usually post them here but I really should! And I should add links back to the blogs that give me prizes, like today! I won $25 GC to amazon.com for winning Rashelle's First Sentence Contest. "He glanced around, careful not to move his head too quickly, and saw the newest victim." Then I received two blog awards from Melanie over on Meanderings of Melanie Sherman. 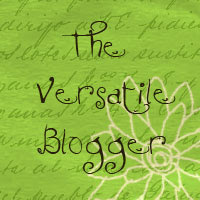 She gave me the Versatile Blogger Award AND One Lovely Blog Award! 1. I rarely get taffy candy for birthdays or Christmas and I've only made the stuff ONCE. Rumors of war hang over Princess Jeniah'speaceful country of Arden, a land that shuns both magic and warfare. Following a lifelong dream, Jeniah forms a telpathic bond with a revered creature called a chayim, who is prophesied to save her kingdom. But when aDarborian knight comes upon Jeniah with herchayim, he sees only a vicious monster about to devour a maiden, and he slays the beast. Devastated by the loss of her chayim, and fearing that her own magic is evil, Jeniah doubts her destiny. When an enemy invades Arden City, they slaughter the people, storm the castle, and execute the entire royal family except the princess. Rescued by the knight who slew herchayim, Jeniah is now heir to the throne of Arden and the only hope for freeing her people from tyranny.